We held a 2-day workshop at U of T last week entitled “Finding Connections – Towards a Holistic View of City Systems“. The workshop brought together a multi-disciplinary group of people from academia, industry, government, and the non-profit sector, all of whom share a common interest in understanding how cities work as systems-of-systems, and how to make our cities more sustainable and more liveable. A key theme throughout the workshop was how to make sure the kinds of research we do in universities does actually end up being useful to decision-makers – i.e. can we strengthen evidence-based policymaking (and avoid, as one of the participants phrased it, “policy-based evidence-making”). I plan to blog some of the highlights of the workshop, starting with the first keynote speaker. The workshop kicked off with an inspiring talk by Jeb Brugmann, entitled “The Productive City”. Jeb is an expert in urban sustainability and climate change mitigation, and has a book out called “Welcome to the Urban Revolution: How Cities are Changing the World“. (I should admit the book’s been sitting on the ‘to read’ pile on my desk for a while – now I have to read it!). Jeb’s central message was that we need to look at cities and sustainability in a radically different way. Instead of thinking of sustainability as about saving energy, living more frugally, and making sacrifices, we should be looking out how we re-invent cities as places that produce resources rather than consume them. And he offered a number of case studies that demonstrate how this is already possible. Jeb started his talk with the question: How will 9 billion people thrive on Earth? He then took us back to a UN meeting in 1990, the World Congress of Local Governments for a Sustainable Future. This meeting was the first time that city governments around the world came together to grapple with the question of sustainable development. To emphasis how new this was, Jeb recollected lengthy discussions at the meeting on basic questions such as how to translate the term ‘sustainable development’ into French, German, etc. A network of city governments dedicated to developing action on climate change [This network became ICLEI – Local Governments for Sustainability]. Jeb noted how the ambitions of the cities participating in ICLEI have grown over the years. Initially, many of these cities set targets around 20% reduction in greenhouse gas emissions. Over the years since, these target have grown. For example, Chicago now has a target of 80% reduction. This is significant because these targets have been through city councils, and have been discussed and agreed on by those councils. An important idea arising out of these agreements is the concept of the ecological footprint – sometimes expressed as how many earths are needed to support us if everyone had the same resource consumption as you. The problem is that you get into definitional twists on how you measure this, and that gets in the way of actually using it as a productive planning tool. Here’s another way of thinking about the problem. Cities currently have hugely under-optimized development patterns. For example, cities with seven times more outspill growth (suburban sprawl) compared to infill growth. But there are emergent pressures on industry to optimize use of urban space and urban geography. Hence, we should start to examine under-used urban assets. If we can identify space within the city that doesn’t generate value, we can reinvent it. For example, the laneways of Melbourne, which in the 1970’s and 80’s were derelict, have now been regenerated for a rich network of local stores and businesses, and ended up as a major tourist attraction. We also tend to dramatically underestimate the market viability of energy efficient, sustainable buildings. For example, in Hannover, a successful project built an entire division of eco-homes using Passivhaus standards at similar rental price to the old 1960s apartment buildings. The standard view of cities, built into the notion of ecological footprint, is that cities are extraction engines – the city acts as a machine that extracts resources from the surrounding environment, processes these resources to generate value, and produces waste products that must be disposed of. Most work on sustainable cities frames the task as an attempt to reduce the impact of this process, by designing eco-efficient cities. For example, the use of secondary production (e.g. recycling) and designed dematerialization (reduction of waste in the entire product lifecycle) to reduce the inflow of resources and the outflow of wastes. Jeb argues a more audacious goal is needed: We should transform our cities into net productive systems. Instead of focussing on reducing the impact of cities, we should use urban ecology and secondary production so that the city becomes a net positive resource generator. This is far more ambitious than existing projects that aim to create individual districts that are net zero (e.g. that produce as much energy as they consume, through local solar and wind generation). The next goal should be productive cities: cities that produce more resources than they consume; cities that process more waste than they produce. 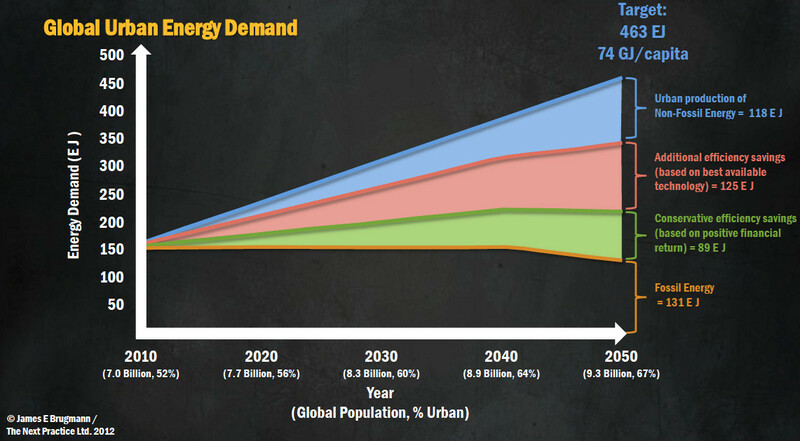 Energy demand. Current European consumption is around 74GJ/capita. Imagine by 2050, we have 9 billion people on the planet, all living like Europeans do now – we’ll need 463EJ to supply them all. Plot this growth in demand over time, and you have a wedge analysis. Using IEA numbers of projected growth in renewable energy supply, to provide the wedges, there’s still a significant shortfall. We’ll need to close the gap via urbanrenewable energy generation, using community designs of the type piloted in Hannover. Cities have to become net producers of energy. Food. We can do a similar wedge analysis for food. Current food production globally produces around 2,800kcal/captia. 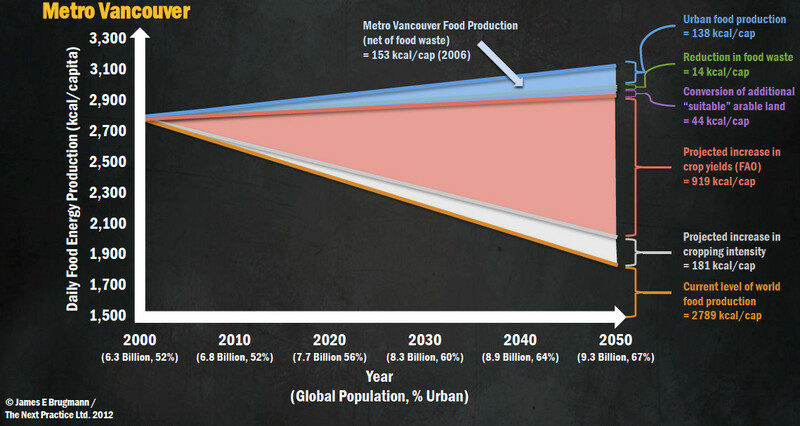 But as the population grows, this current level of production produces steadily less food per person. 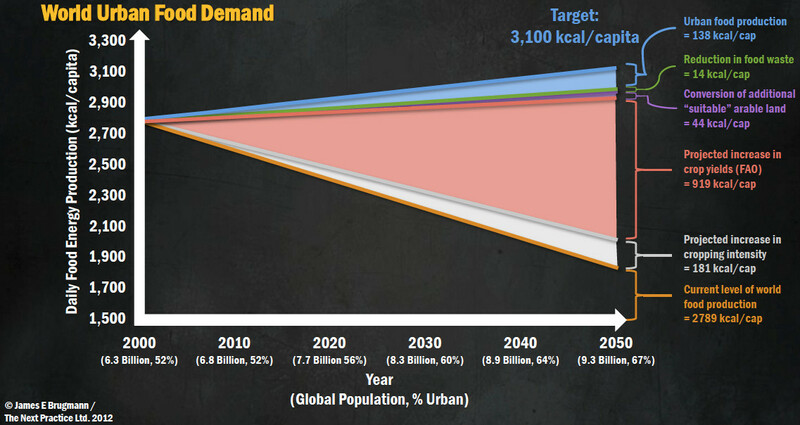 Projected increases in crop yields, crop intensity, and conversion of additional arable land, and reduction of waste would still leave a significant gap if we wish to provide a comfortable 3100kcal/capita. While urban agriculture is unlikely to displace rural farm production, it can play a crucial role in closing the gap between production and need, as the population grows. For example, Havana has a diversified urban agriculture that supplies close to 75% of vegetables from within the urban environment. Vancouver has been very strategic about building its urban agricultural production, with one out of every seven jobs in Vancouver in food production. Other examples include landfill mining to produce iron and other metals, and urban production of nitrogen fertilizer from municipal biosolids. In summary, we’ve always underestimated just how much we can transform cities. While we remain stuck in a mindset that cities are extraction engines, we will miss opportunities for more radical re-imagings of the role of global cities. So a key research challenge is to develop a new post-“ecological footprint” analysis. There are serious issues of scaling and performance measurement to solve, and at every scale there are technical, policy, and social challenges. But as cities house ever more of the growing population, we need this kind of bold thinking. 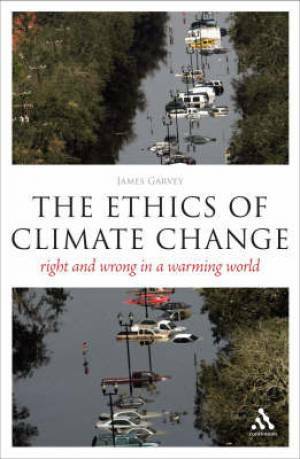 Several people have mentioned to me that I missed an interesting interview on the CBC with the author of a new book on assessing carbon footprints, called How Bad Are Bananas? From the blurb, it sounds like it does a great job crunching the numbers to provide useful advice on where we should focus out actions. Here’s hoping it’s as strong as Mackay’s book on sustainable energy.